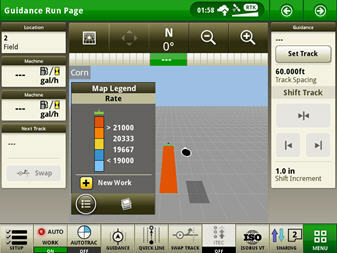 See coverage and as-applied maps for machines working in the same field at the same time. Ensure complete field coverage with multiple machines even in low light and/or dusty conditions. Reduce over-application leading to more accurate documentation data and lower input costs. 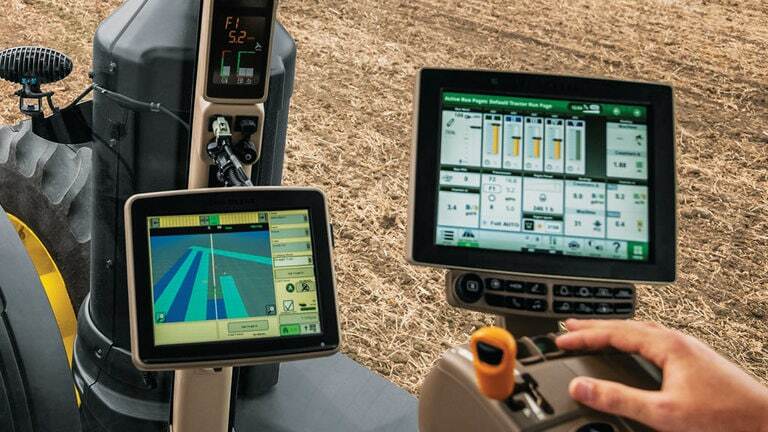 Using Gen 4 In-Field Data Sharing and Precision Ag applications, maps and guidance lines can be used together by up to six tractors, sprayers, nutrient applicators, or combines to reduce overlap and improve placement. Machines can work together at the same time or use maps created earlier by another machine to increase efficiency. 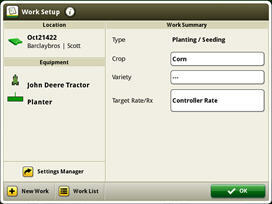 Using a streamlined setup process, In-Field Data Sharing matches maps and guidance lines together based on the information entered in the Work Setup screen, as some of the same information is needed to document an operation. 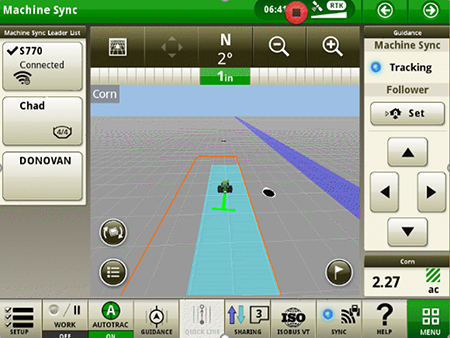 Sharing coverage maps takes the guesswork out of shutting off planter rows, seeding sections, sprayer nozzles, and fertilizer spreaders or ranks when crossing over areas already covered by another machine. In operations where multiple products are being applied, like planting with a starter fertilizer, a map is shared for each product to make sure the product is being applied in the right place without being over-applied. This capability is especially beneficial when working in low-light or dusty conditions. 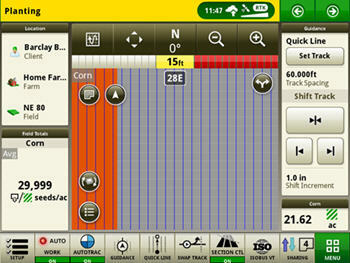 Operators can quickly share guidance lines with other displays working in the field to be sure that seed, nutrients, and crop protection products are placed properly with reduced overlap resulting from use of the same guidance line. 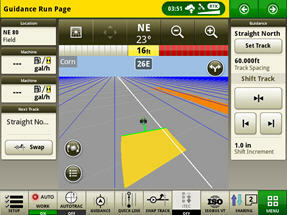 Sharing maps and vehicle position helps confirm proper performance and help producers manage operations in the field. 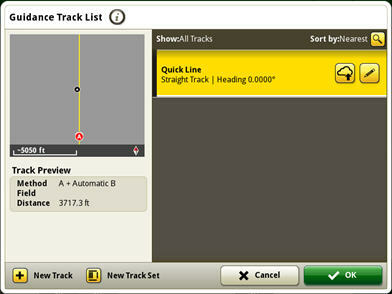 View other operators’ as-applied maps to confirm those machines are calibrated and performing properly. View machines’ yield and moisture maps to get a whole field view, to view progress, and to make sure nothing is missed while confirming machine and crop performance. 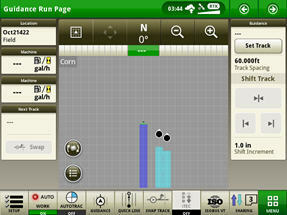 Confirm the position of tractors working with grain carts or in other support functions. 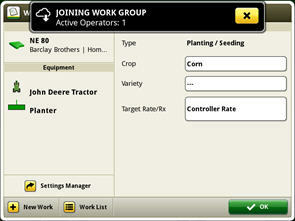 In-Field Data Sharing uses the field, operation, and crop – already required for documentation – to match coverage and guidance lines between machines for tillage, planting, and harvesting, making setup a breeze. Fertilizer and crop protection applications require an additional match on products to make sure the right information is being shared. 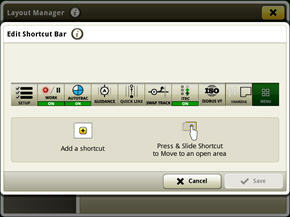 Use the sharing shortcut to quickly view how many machines are in the same group, and access controls and confirm the system is working properly. 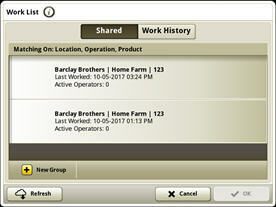 Work History and Shared Work allow operators to view and select the same operation from a different time if different maps are required to finish an operation. Accessed from the Work List screen, Shared Work displays the data available from the cloud, while Work History displays the information created using the display being used. 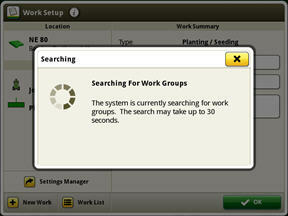 For example, if multiple herbicide applications are being made, a previous application can be selected to finish the field.